-EDIT- Fixed some continuity errors regarding lack of snowfall in panel 2 and a lack of waterbending bracers. I frequently run outside under dressed in the winter. Bad idea. Baaaaad. The link to the earlier comic doesn’t work unless I remove the extra characters from the end of the url. Thank you, and also thank you to All Purpose Guru as well, for the assist. Don’t mean to nitpick, Dave, but it looks like Sai Fen isn’t wearing her armbands in panel four. I know I’m super excited by this development, I thought Selkie was just going to tell Sai Fen about her bow not give a demonstration! But knowing Selkie this actually is quite true to character. I’m excited by the prospect of finding out who her mother is in relation to the war, and whether it was foreshadowing when Selkie asked if she was a mermaid princess or something. Gotta see how this plays out. Looks awful summery, out the door, in frame two. With all that green grass. Oh no…please tell me her mom isn’t a war criminal. But that they know something bad has happened…no wait. I don’t want Selkie’s mom dead. That was a recording, had to be made before she gave Selkie up too. Plo Quar is in that page (albeit, barely). So just seeing this has kind made it click in my head. I have a very Selkie reaction to the cold. If my body temp changes too quick I break out in hives and have gone into anaphylactic shock from it more than once. I really like this arch. I hope Selkie gets some answers! I was wondering the same thing. Magic water!! A) The lost Jin’Sora princess. Freaking out Sai Fen with this revelation. B) An unwilling Jin’Sora/Sarnothi spy. Obviously *something* in the recording freaked out Sai Fen, the way she called for Pohl. Looking at the previous time she got too far from the hairbow, it’s not clear that it started looping before she touched it and caused the recording to terminate. Also, since this is the second time she got too far from the hairbow, it might not be the same recording. It’s possible Selkie just handed her the bow and ran without any explanation or warning, leaving Sai Fen unprepared for what she is seeing. Or, possibly, since the tech is sensitive to personal proximity… it could be a very VERY different reaction/recording since another, possibly opposing-faction Sarnothi is holding the bow. Looks like it’s time for some revelations – let’s just hope it’s not of the 4 horsemen variety. I have only 1 Question. A big one. Why does it seems Selkie is happy when she is running outside. It seems to me like she is smiling. SHe’s excited to be sharing her Sarnothi special secret with someone who can giver her answers and obviously has similar technology. My totally unfounded guess is that Selkie’s mom is a princess or whatever the sarnothi equivalent of royality would be. What are the odds that Selkie’s swoosh is just to trigger the bow, and not due to Sai Fen’s reaction? That’s exactly what it is. That’s why she said she is ‘making distance’. The bow only shows the hologram when Selkie gets far enough away. It doesn’t seem to activate until she is outside. Ah. I was under the impression that it was more of a “blast radius” sort of ‘distance’. Dave knows we love to see the “Selkie swoosh” – patent pending. well here is my thoughts one is selkie is the granddaughter of the head of the Jin’Sorai clan in page 406 we see the 4 heads of the clans the Tel’Dora the Mor’Kama the Jin’Sorai and the Sar’Teri and selkie’s mom kind of looks like the head of the Jin’Sorai clan or two she did something to help the Sar’Teri kill the Jin’Sorai. Dude. Punctuation. Why should I read your post if you don’t bother to make it readable? well here is my thoughts. 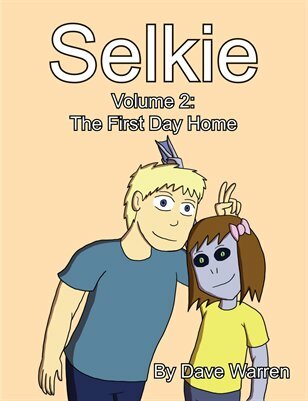 one is selkie is the granddaughter. of the head of the Jin’Sorai clan in page 406. we see the 4 heads of the clans the Tel’Dora. the Mor’Kama. the Jin’Sorai. and the Sar’Teri. and selkie’s mom kind of looks like the head of the Jin’Sorai clan. or two she did something to help the Sar’Teri kill the Jin’Sorai. I kid you not I zoomed in and looked at each panel to see if I could spot someone similar to her… panel 8, brunette with the ponytail, yellow tank top, behind Antoine’s head, looks to have bluish-purplish skin. Either it’s a mislabel, or proof that Plo Quar (hopefully) isn’t dead as a few others have suspected. If you read the comments on that strip Dave confirms it’s her. Nice catch, I totally missed it back then. So Selkie’s mom is alive and just sorta… around? Living her own life somewhere? I understand there are probably some circumstances here, but uhhh… does she just intend to come back and collect Selkie sometime? I really hope this isn’t some, “Selkie and her mom are royalty so they both went into hiding separately under assumed identities.” thing. Unless Selkie’s family were very aggressive in seeking revenge on the humans, I don’t see why they’d need to be separated even if their clan was the ‘bad’ clan. It seems like her family would’ve had to had been aggressive in attacking, but maybe that’s why her father hasn’t been shown in the flashbacks. Maybe her mother was more peaceful, but was frightened her daughter would be targeted if they were together. I dunno, the whole thing seems off and the only way I can rationalize it, is that her family was part of the bad side and now fear drives her to keep her daughter secluded and away from her in order to protect her… but even so, their race isn’t all over the place on the surface, so that seems a bit extreme. I mean, she, herself, was walking out in the open, seemingly carefree and… honestly, Selkie sticks out. If someone of her kind saw her, she’d be recognized instantly as to which clan she was a part of. So she’s not really safe this way either. It doesn’t add up… need more information darn it! So maybe her mom is somehow involved with the CIA and working on integration, or working for them, but I can’t say I really have any ideas for sure. We won’t get solid answers until the comic brings us to that point though; it could be soon, it could be later… it could be much, much later. Who knows. Whoa! That is a *great* catch. So it tells us she’s still alive and even living among humans (she’s even dressed like one). Indeed, however the big question right now is why she had to separate herself from Selkie… and why they’re in the same general area, however they haven’t run into her at all yet. My best guess is it has something to do with protection. I don’t know about the whole “Selkie’s a princess” theory, but maybe her mom is important in a political party of some sort, or maybe working for/with the CIA. And keeping Selkie in the dark about it is her way of protecting her? I can’t say for certain though. Well, even so, it doesn’t really make sense as to why she needs to be protected. From what? Pohl and his family live together as a family on the surface. They weren’t forced to give up Suko. The reason why Selkie needs protection eludes me. And are they somehow incapable of protecting and keeping her safe with her mother around? The government can’t keep them both safe together? And again, safe from WHAT? Her own kind? There’s so few around and we’ve not even SEEN anyone aside from Pohl’s clan. From humans? If that’s the case, her being separated from her mother is silly. Pohl and his family do it just fine. So what’s the deal? … Or maybe her mother MADE a deal with someone and had to give up Selkie as a result…? Maybe whatever danger they were in that made her give up Selkie already passed. My impression is she just dropped her off somewhere and people didn’t know what to do and the government got involved only after that, maybe they tracked her down and offered her protection too, but after the fact. Mother birds fly away from their babies and act hurt so the predators focus on them and not on the helpless babies. I don’t know if any predator species acts similarly, but this is a legitimate reason to separate from one’s loved ones, IF and ONLY IF you have good reason to believe that the enemy will focus on you to the exclusion of your loved ones, or won’t be able to track down your loved ones on their own. Finally caught up! Yay! I’m completely in love with this comic! I can’t believe how weirdly similar Selkie is to little bitty me, though. We even have the same 504 plan. Yays! Glad you made it all this way. Looking forward to another 800 pages and then some!